REDUCED TO SELL NOW! Custom Gated Estate Top-of-the-line amenities! Enter through stainless steel glass and granite doors to a meandering stream. Indoors find billiards rm, trophy rm, gym, media rm w/5 TVs, theater rm w/ soundproof walls and surround sound, and upgraded kitchen w/Wolfe appliances and black lacquered cabinets. FAB Mstr Bdrm. Outside, see 40' pool/spa, Olympic-size tennis crt, fire pit, built-in BBQ and 20' serving counter space, guest home, and Panoramic Views. Poway Award Winning Schools., Blt by John Neill, Victor Palos (Arch. 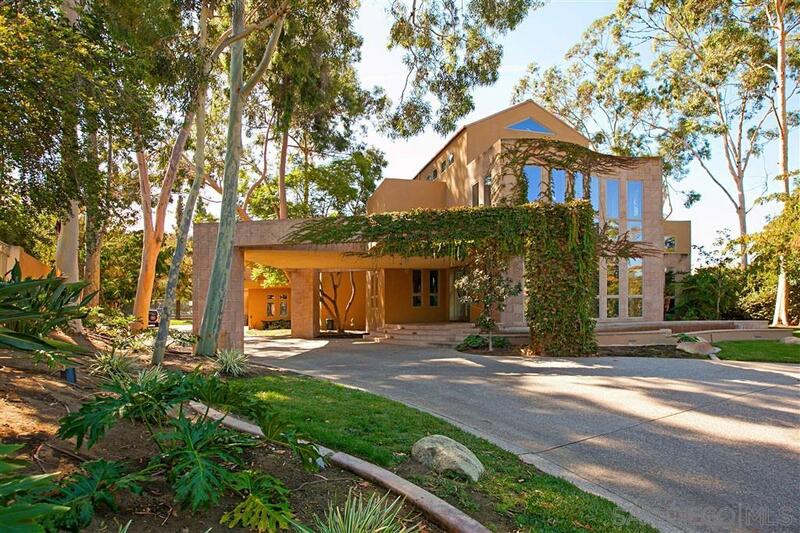 from Upland Area) This home was built w/the finest custom quality workmanship and finishing. Privacy and unique Contemporary Design are the focal points in this 10,000 sq ft masterpiece. Plus 1200 sq ft guest home w Liv Rm, Sep Bdrm/Ba, and upper deck/patio for viewing. There is a meandering stream flowing under the floors in entry, hardwood maple hallways w curved walls of glass block lead you to the stunning Liv Rm & Din Rm - Theater Rm seats 12+, w/140 inch curved screen, leather chairs and soundproof walls, upgraded equipment. Billiards Rm & Media Rm w 5 TV's was designed with the sports fan in mind. & Gym Area. Kit features New European lacquer black cabinets, Wolfe Appliances, Upgrades too many to mention, stainless steel abound, granite counters, fit for a Gourmet Cook. Olympic size tennis court *40 ft pool/spa & fire pit * built in BBQ w over 20 ft of granite serving/counter space for those outdoor pool parties. Master suite is grand w/private decks/ upper Crows Nest for watching the Sunrise/Sunset. All bedrooms are large en suites, with decks. Truly a unique home. Award Winning Poway School District. A Must Show! !